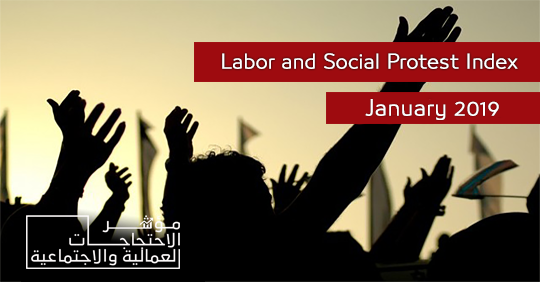 The Freedom of Expression for Labor and Social Movements program of the Arabic Network for Human Rights Information (ANHRI) launches today the Labor and Social Protests Index for the month of January 2019. Using monitoring and analysis, the report addresses 47 protests, including 36 social protests and 11 labor and professional protests. According to this month’s index, the “Building and Construction Materials” sector came at the top of sectors that witness labor protests, while the “Local Services” sector topped the list of sectors against which social movements have protested. The index also noted an unprecedented rise in committing suicides by jumping in front of Metro trains, a matter which requires a serious study by psychology experts and sociologists to explain this growing phenomenon. The January Index included the geographic distribution of all the protests staged all over Egypt during the month and briefly introduced all the protests that have been monitored. The Freedom of Expression for Labor and Social Movements program said: “We have not seen major protests that can stand out in January. The number of participants in most of the labor and professional protests was estimated at hundreds or dozens, whereas the social protests were organized by a limited number of individuals that can be estimated at dozens. The number of protesters didn’t reach thousands unless in the case of solidarity with the Lawyers Syndicate head; during the appeal hearing challenging the prison sentence issued against him for not implementing a court ruling”. The program added: “Labor protests are dominated by negotiation, while social protests are dominated by repression and intimidation or by spontaneous end”.